So you just lost your smartphone. It isn't the end of the world, but it sure feels like it. In addition to the specter of shelling out another couple hundred dollars to replace the hardware, you're facing the loss of all your contacts, your schedule, your to-do lists, your passwords (if you really weren't careful and stored them on the phone), and, oh yeah, the dicey photos you took at the bar last Friday. All of that is gone, at least for the moment, but if your Apple iPhone, Google Android phone, RIM BlackBerry, or any other smartphone falls into the wrong hands, that vast archive of your personal information won't just be forgotten--it could be cashed in. The loss of a smartphone wouldn't be so bad if it ended with merely a bit of embarrassment. Since many people now use smartphones for online banking, travel reservations, and storing sensitive business documents, however, a great deal of very private data ends up on the device. Apparently not much, according to some industry experts. And that's surprising, given the number of apps and phone features available for safeguarding data. According to McAfee, best known for its antivirus products for personal computers, you're 15 times more likely to lose your cell phone than your laptop computer. New wireless-transaction services will soon allow a smartphone to replace cash or a credit card at a store's point of purchase. Firethorn, which makes many of the mobile-banking applications that major banks offer, is putting the final touches on SWAGG, an application that will make it possible to purchase, give, and spend gift cards, as well as to manage store-loyalty programs, from a single point. Retailer American Apparel has announced that it will support the SWAGG system for purchases from its stores. Phones are often lost by accident, but waves of cell phone thefts are nothing new in major cities. For example, passengers of Boston's subway system recently benefited when the Massachusetts Bay Transportation Authority (MBTA) Orange Line was fully wired for T-Mobile and AT&T cell phone service. The other side of the coin, however, has been a rise in cell phone thefts, up 70 percent in the first quarter of 2010 in Boston. According to the same report, 80 percent of the thefts in Philadelphia's subway system are of cell phones. Though crime stats in New York have declined in recent years, cell phones and iPods lead the way among the types of items stolen. Transit authorities now make regular announcements--in addition to posting signs on platforms and in trains--warning riders not to flash electronic gadgets unnecessarily. Even people standing still on city sidewalks aren't safe from cell phone thieves. 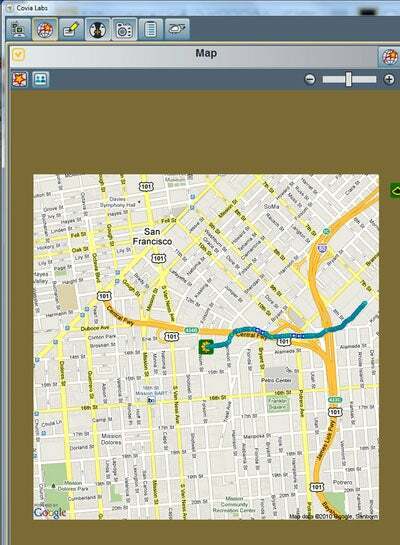 A San Francisco thief steals an iPhone while a demo using tracking software is in progress. The software shows his location, and he is arrested 10 minutes later. What the thief didn't know, however, was that the demonstration was already under way, and that he was being tracked on a computer screen by Kahn and others. Everyone viewing the tracking was initially perplexed as to why the intern seemed to be moving so fast across the city. However, in less than 10 minutes, the thief had been pinpointed via Covia's software and arrested; the iPhone was recovered, according to MercuryNews.com.